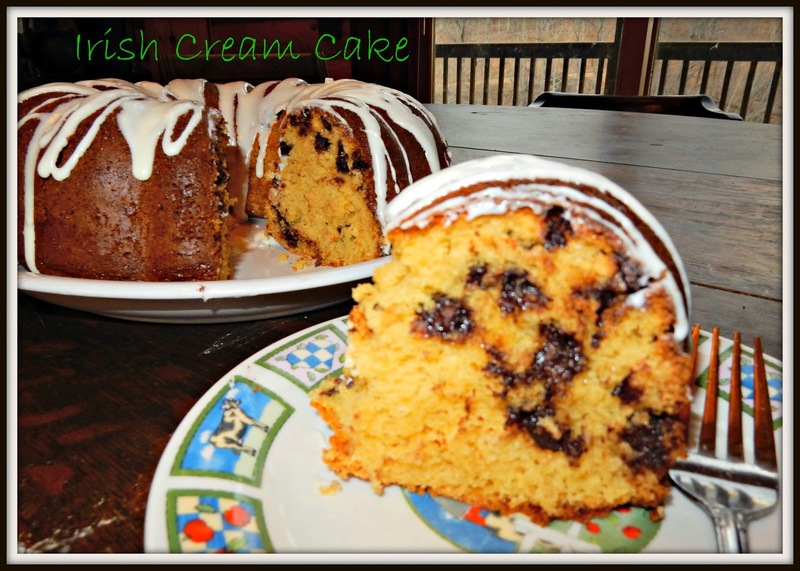 A few years ago I went to a recipe exchange potluck, and one of the recipes brought was an Irish Cream Cake. I've wanted to make it since then, but had not because every time I thought about it, I remembered I needed to pick up Irish Cream. Well, I finally made a trip and got some, and was able to make this wonderful cake. It's very easy to toss together. 1 can cream cheese icing (you will only use a portion of this). Mix cake mix, sour cream, eggs, Irish cream, and vanilla pudding. Stir in chocolate chips. Pour into a bundt pan and bake at 350* for one hour. After cake cools, heat icing in microwave for 30 seconds and spoon drizzle over cake. I was a little leery of the canned frosting, as I don't really care for the taste. But it was good drizzled over this moist and flavorful cake. I think you could make a small amount of frosting if you wanted.I always make corned beef, and I'm Czech. MMM, perhaps even I could make that one. Just in time for St. Patrick's Day.... one could even try green frosting, or maybe not! Around here it seems everything turns green for that one day! misschien smaakt het op andere dagen ook wel lekker. I wish I lived near you. I could help you dispose of the left overs when you make all these exotic dishes and treats. Oh my gosh, I have to try this, the recipe looks so good! I have no St Pat's recipes, but used to make a bunny cake for Easter. It looks good! Yes, I agree with one of your commenters; you can make just a small amount of frosting. I personally don't like the cans; I guess because whenever I make cupcakes or cakes, the family wants butter cream frosting. This looks/sounds really good. I might have to try it during these snow days. Oh please...looks so yummy! I really want to try this recipe. And here I thought Irish cream was just for coffee flavoring. I decided to go all out w/the St. Patrick's Day meal this year. I don't usually... but I think it'll be fun. And your cake looks great! This sounds good! My husband makes corn beef and cabbage. I don't know if we'll have anything else or not. I always put a drop of green food coloring in the toilet, and tell the boys a leprechaun peed in our toilet. YUM... That cake looks good enough even without frosting. I too don't care for the 'canned' frosting.. I would make my own cream cheese frosting IF I used any at all. That cake looks so moist and delicious. Thanks for sharing.